by Andrew Cayton. Softbound, 340 pages, 6" x 9". 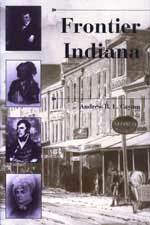 Cayton�s lively new history of the frontier period in Indiana puts the focus on people, on how they lived, how they viewedtheir world, and what motivated them. Here are the stories of Jean-Baptiste Bissot, Sieur de Vincennes; George Croghan, the ultimate frontier entrepreneur; the world as seen by George Rogers Clark; Hosiah Hamar and John Francis Hamtramck; Little Turtle; Anna Tuthill Symmes Harrison and William Henry Harrison; Tenskwatawa; Jonathan Jennings; Calvin Fletcher; and many others.